The theme of promotions for this year's Super Bowl is "If A Then B." If the team in your city loses, then you get a free Uber ride. If the game goes to overtime, then you get free wings. If the teams combine for more than 1,000 yards, then Oikos is giving out free yogurt. For the most part, these deals hinge on unlikely scenarios. 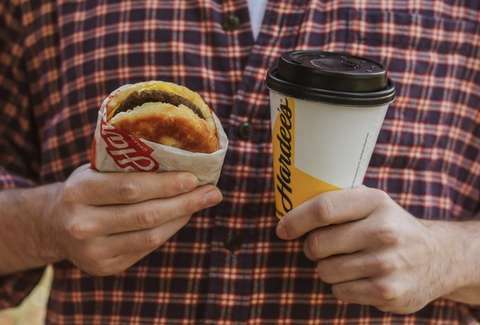 However, Hardee's has launched one that is more likely and could result in a free breakfast. Drawing a forced line between its own biscuits and a pick-six (Do this for the Stanley Cup! People actually call pucks biscuits! ), Hardee's is giving out free breakfast should the game features a pick-six. If you only watch for the commercials, a pick six is an interception that's returned for a touchdown. If that happens, everyone who can get to a participating location will be awarded a free Made From Scratch Sausage biscuit on February 8 between 7 and 10am. There isn't anyone better to promote the deal than former Pittsburgh Steelers linebacker James Harrison. And that's who is shilling for free breakfast awareness. In 2009, Harrison intercepted Kurt Warner and ran the ball back 100 yards for a touchdown. It was the longest play in Super Bowl history at the time. This year's Super Bowl match between the Los Angeles Rams and New England Patriots will mark the 10-year anniversary of that catch which ended with Harrison on his back, catching his breath in the end zone while his team celebrated. So, if you've got no horse in the race, at least you can cheer for yourself. Cheer for a biscuit.